Typically I avoid sushi restaurants since I hate everything about the taste and texture of seaweed. But I was assured that there were plenty of menu options that didn't involve seaweed, or even raw fish (which I generally stay away from since I'm not a fan of intestinal parasites.) My first visit to Sushi Hat was for a Tweetup. But then I couldn't get it out of my head and didn't feel that I had paid close enough attention to write a review, so I went back with my sister for my birthday lunch for a second look/taste. I had heard through the grapevine that the current restaurant owners hadn't made any/many changes to the interior of the restaurant when they opened. I've never actually been to that restaurant location before, so I had nothing to compare it to when I went. It has gone through several reinventions and most Hatters will recognize it's location as the old Heidelhaus restaurant. Whether they had made changes or not was immaterial, as the current interior is modern and stylish. What I especially like is the feeling of privacy given by the column lamps between the booths and the decorative screen in the middle of the dining area. Even when the restaurant was full during the lunch rush, you didn't feel like everyone was watching you eat or listening in on your conversation. The only thing I didn't like was that the booth seats were very low, I felt a bit like a little child sitting at a grown-up's table. There is angle parking available in front of the restaurant and you can also park on the street alongside the building. What can I say other than "yummy"?! Unfortunately I forgot to take pictures of everything before I voraciously devoured it. 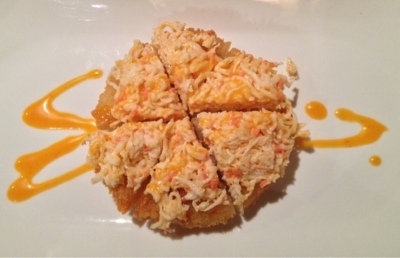 My absolute favourites were the spicy crab meat pizza, with crab meat on a patty of breaded deep-fried rice, which was a delightful combination of textures and flavours. The chicken teriyaki on white rice had seared chicken and included black sesame seeds in the teriyaki sauce, which was a nice touch. I'm not sure what type of white rice it was served on, but I need to find out as it was some of the best rice I've ever eaten. 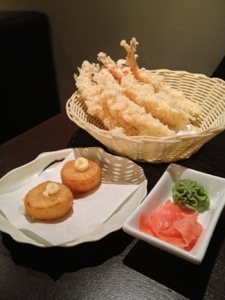 If you've only had breaded deep-fried shrimp before, you must try the tempura shrimp, it's a revelation, so light and crispy! Everything I ordered was cooked. My sister had the Mango Crispy Roll, Tuna Roll and Salmon Roll and said it was some of the best sushi she's ever had. The first thing you need to know is that Sushi Hat is a made-to-order buffet, which means that you pay a flat price, and can eat as much as you want. They freshly prepare your order each time you request an item. But, that being said, if you order more than you can eat, they will charge you the per item price for the leftovers in addition to the flat rate. So it's best to order a few items (the orders are quit small), gauge how full you are, then order more, as many times as you need/want to until you are full. The prices are very reasonable. If you would like to give the place a try, but don't want to spend the $23.95 for the evening dinner, then go for lunch Monday through Thursday and only pay $13.95/adult. The first time I went, we were a large group, and some of the orders took longer to get, and a couple were forgotten. Something else you should know is that if multiple people order the same item, they will come on the same platter, which you then need to divide amongst yourselves. 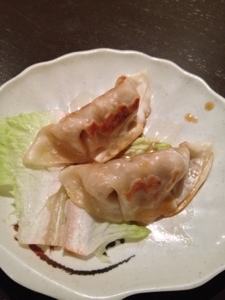 The second time I went there were only two of us and we received everything we had ordered, promptly and accurately. The servers were pleasant and didn't rush us out even when it was clear that we had finished eating and were just visiting. Hopefully I've given you enough information about the unique ordering style that you don't feel intimidated and will give this place a try. I will definitely be going back to this restaurant again. UPDATE: Apparently this restaurant has very recently closed/combined with J&T House on Carry Drive which has the same owners and a similar menu. Correct me if I'm wrong, but I believe "Sushi-Hat" has now closed down....apparently going to be converted to a Chinese food buffet. Not sure if it will be the same owners or not. But don't fear, J&T House is still in full swing for your sushi needs.